A DELIVERY SERVICE YOU CAN RELY ON! Deadlines, deadlines, deadlines – whether they fill you with dread or adrenalin few of us can avoid them. But one thing’s for sure, when there’s work to be done everyone appreciates being fed and watered! And here at Expresso we’re only too glad to be of service! Lunch packs for away days, sandwiches for visiting clients, lunch for special guests, breakfast for early birds, coffee and biscuits for conference delegates or nibbles to see you through, we’re here to help. We offer a free* seven-day-a-week delivery service across Norwich and beyond. From breakfast time to suppertime, we’ll make sure your colleagues, guests and clients keep their spirits up with great tasting, home-made food. With packages available including drinks and service it’s never been easier to entertain! And there’s no need to fret about food allergies and intolerances. 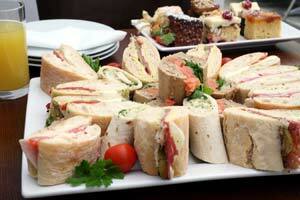 Because we make everything ourselves, we’re able to cater for most dietary requirements and special preferences. Interested in finding our more about our delivery service? Check out our menus for inspiration!